Morning Glory - The More I Read. . . I'm not sure if this has ever happened before, but the last three books I've read have ALL been fantastic! 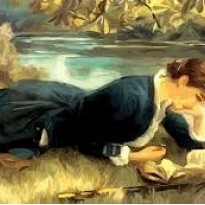 First there was Georgette Heyer's The Convenient Marriage, then the metafiction to end all metafiction romance Again by Kathleen Gellis Seidel. 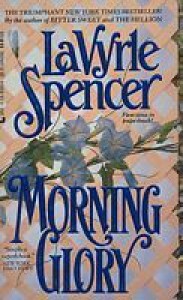 Now, there's Morning Glory by LaVryle Spencer. I find myself struggling for the right words. Words fail me to adequately describe this author's emotionally gripping storytelling gift that pairs two of the most unlikely and complex characters that ever graced the pages of a romance novel. Not to mention a WW II setting that is as unusual as it is unforgettable. It's 1941. Will Parker has drifted into Whitney, Georgia, working for the past three days at a saw mill after a five-year stint in a Huntsville, Texas prison for the murder of a prostitute. Will is literally starving and just that morning stole a Ball jar of buttermilk from a nearby well on a farm and a green apple. He also took a shirt, an old pair of jeans, and a green towel to wrap around the buttermilk as an insulator. He loses his job at the saw mill at the opening of the book after foreman, Harley Overmire, a hirsute bully of epic proportions, tries and fails to provoke Will into a fight. Will is used to being beaten down and knows what he has to do to survive this bully and others. As he leaves the mill with $9 of wages in his pocket, one of the men tauntingly tells him to check out the Widow Dinsmore's place because she's 'so hard up she'd probably even settle for a jailbird' like him. Of course jeering laughter follows him as he leaves. Har! Har! Do I hear a jackass braying in the background? Vickery's Cafe is an odd place for a man to come to a fork in the road, but Will is confronted with just that. Along one path stands a gatekeeper who is a 'buxom young woman' with bleached hair 'piled high and tumbled onto her forehead' like Betty Grable, thinly-plucked eyebrows, 'a come-hither jut' of her rounded hips, and 'talons polished the same vermillion shade as her lips.' Oh and she's popping gum. Her name is Lola. No, no, just kidding. That's Lula, but you just know whatever Lula wants, Lula gets, too. Yeah that would be Crazy Elly, aka the Widow Dinsmore, who's so hard up for a man that she's put an ad in the local paper and hung a card up at the sawmill asking for volunteers. Naturally Will wonders what kind of woman would advertise for a man and what kind of man considers applying for it. Apparently he is that man because he takes a good long look at Lula and asks for directions to Rock Creek Road. Can't say I blame him. Lula is scary. When he finds the Dinsmore place, it's almost dark which was a blessing in disguise. Beginning with the road which was almost impassable being 'steep,' 'rocky', and, 'full of washouts.' But that's not all. He left the road and approached through the woods, standing hidden in the trees, studying the place. It was a mess: chicken dung, piles of rusting machinery, a goat chewing his cud on a back stoop that looked ready to drop off the house, outbuildings peeling, shingles curled, tools left out in the weather, a sagging clothesline with a chipped enamel kettle hanging from one pole, remnants of a weedy garden. And then there's Eleanor Dinsmore. And that's when the other shoe drops for Will because Elly is 'pregnant as hell.' Like two stray dogs they circle each other warily. He notes her 'worn cotton clothes', the soiled skirt, hair 'flying around like goose grass', and a face that was old before it got a chance to be pretty. She sees a lean, long face, pants so loose on a too thin frame she's surprised they stay up around his hips, expressionless brown eyes and unsmiling though nicely shaped lips. But they strike a bargain, and each thinks the other won't stay/won't let him stay. These two have to be the most unlikely couple in a romance novel I think I've ever read. Reclusive Elly Dinsmore who shies away from the town and its people who mocked and teased her mercilessly as a child, raised by religious fanatics who kept her locked in the house with the shades drawn because she was illegitimate, and then the coup de grace of being labeled 'crazy.' Will Parker, a man whose mother abandoned him, placed in foster care till he was 14 when he ran away, who has no idea when his birthday is, drifting from one place to another, no family, no friends, no roots. Oh yes, he's also an ex-con and unemployed. Both are so full of insecurity that they find it hard to meet on common ground. How can he want worthless 'Crazy Elly', she thinks. What woman wants a man who was in prison for murdering a prostitute, thinks Will. But find each other they do. It's a testament to this author's writing that makes this love story between Elly and Will believable, compelling, and emotion-packed. By Chapter 15, my heart had been ripped out and I was reduced to ugly crying. There was no quiet sniffling or polite dabbing at my tear-filled eyes. No, this was nothing but great big old honking sobs that I couldn't control. And it continued right on through their exchange of letters, their reunion, and the trial at the end of the book. I can't ever remember reacting so strongly to a book before, but Morning Glory did. This author is a powerful writer, breathing life into these characters and others in Whitney, Georgia until they popped off the page. Like Miss Gladys Beasley, the town librarian and spinster extraordinaire. I loved her from the top of her tightly curled hair down to her sensible (and quiet) shoes. Such a great character! LaVryle Spencer is a master at pitting both external and internal conflicts to separate these two lovers and working through those conflicts in an entirely believable, utterly satisfying manner. I'm not going to spoil this book, because if you haven't read Morning Glory, I don't want to ruin the experience. All I can say is this: Go read it. Now. You won't be sorry. I'm going to end this review with one of my favorite parts in Morning Glory. There's a tradition of tying a yellow ribbon round a tree to signify remembrance of a loved one who is away from home and the hope for their safe return. Thankfully it's not Tony Orlando and Dawn to whom we owe this touching tradition as it is purported to go back at least 400 years in one form or another. A 1917 version of a song titled "Round Her Neck She Wears a Yeller Ribbon" (For Her Lover Who Is Far, Far Away) was reworked in 1949 and a retitled "She Wore A Yellow Ribbon." Many artists in the 1940s like The Andrews Sisters recorded their version of the song. Here's a snippet of the lyrics courtesy of Wikipedia. When Will returns to his and Elly's home, he finds not a yellow ribbon tied around their favorite sour apple tree but dozens and dozens and dozens of flowers. Flowers! Everywhere, flowers . . . and all of them blue! Gay, uncivilized blossoms, clambering unchecked without a hint of order or precision. How like his Elly to sow wildly and let rain and sun - Will smiled - and all those years of chicken manure do the rest. He scanned the clearing. Blue - Lord a-mercy, he'd never seen so much blue! Flowers of every shade and tint of blue that nature had ever produced. He knew them all from his study of bees. Read Morning Glory. It's one of the best books I've ever read.